Atletico Madrid managed to get a crucial away win in the first leg of the Champions League last 16 match against AC Milan, as they also set foot into the quarter-finals of the competition. This is pleased the manager Diego Simeone, who says that the club played an intelligent game at the San Siro. AC Milan came into the match in a very bad shape after recently changing their manager following a poor season. Former midfielder Clarence Seedorf had taken over from Massimiliano Allegri, but results have shown little promise ahead of the match. However, Atletico were under the pressure from Milan throughout the encounter. The Italian club created a lot of opportunities over the course of the 90 minutes, but they were unable to take any of them. On the other hand, Atletico managed to take advantage of some poor defending in the latter stages of the encounter to score crucial away goal – and subsequently get the win – through Diego Costa. The 25-year-old has been impressive form this season and he continued to demonstrate his importance to the team with a crucial goal, which could potentially take the Spanish club to the quarter-finals of the competition. Atletico have done extremely well to maintain their momentum throughout the season and they are also challenging for the title in the Spanish league. “We knew we were going to face an intense Milan side, especially in the first half. In the first half we lost too many balls in midfield and suffered a little. We didn’t play with the right tempo. In the second half we changed, we blocked (Mario) Balotelli and Kaka better and we started to control midfield. We kept ourselves in the game and the goal we scored allowed us to get the result we were hoping for,” said Simeone. Manchester United tried to sign Cesc Fabregas from Barcelona last year as David Moyes wanted to combine Van Persie with the Spanish midfielder as they used to play together in Arsenal some years ago. Unfortunately for Moyes, Fabregas decided to stay with the Catalan club, Barcelona where he now plays an important role as he is a consistent starter for Gerardo Martino having already played 23 matches for Barcelona in this season. The former Arsenal player admitted and stated that he is flattered by having attracted the interest of a team with the caliber of Manchester United but the midfielder has no desire on leaving Barcelona anytime soon. ‘’It’s always flattering when a club like Manchester United talks very well about you and you can see they want you’ he said. But I’m going through an amazing moment at Barcelona now. I’m playing every week and I feel very important to the team. I’m very happy right now.’’ Fabregas told Complete Betting, the Bookmaker reviews website. David Moyes ultimately had to settle by signing Marouane Fellaini from Everton as the Scottish coach wanted to solve some of the main problems that Manchester United has been going through in this season and the midfield of the team was displaying many weaknesses which is why Moyes wanted to solve it by signing Fabregas and instead had to go for Fellaini . Fellaini was making impressive performances when he played with Everton but when he joined Manchester United, things took a huge turn as he has not been able to live up to the expectations that were created when he joined Manchester United with a price tag of €27.5 million. Juan Mata is the latest acquisition of Moyes and the former Chelsea player has made a better debut than Fellaini but United are still struggling to climb on higher spots at the Premier League and Moyes might try to make another move for Fabregas in the summer. Atletico Madrid recently moved to the top of the Spanish league table after their title rivals Barcelona and Real Madrid dropped points in the latest round of matches. They have thus become the first team outside the realm of Real Madrid and Barcelona to go top of the table in the last five years. Atletico Madrid failed to go two points clear at the top of the table after managing only a 1-1 draw with Sevilla during the weekend. They came into the match level on points with Barcelona after having managed to sustain the challenge since the start of the season. They were expected to be one of the competitors for the Champions League places, but this has been a stunning season for the club managed by one of their former players. Barcelona failed to win their match against Levante after a 1-1 draw. This result has now meant that Barcelona and Atletico Madrid only have a one-point advantage over Real Madrid, who won their match against Real Betis 5-0 in emphatic fashion. Madrid are slowly coming to their best form and this has put Atletico Madrid’s chances of winning the title in jeopardy. Despite this, manager Diego Simeone says that he is happy with the result. The club recently played against Barcelona and drew that match as well. A number of Atletico Madrid players have been linked with moves abroad, but they would want to win the title in an extraordinary season for the club. Summer signing David Villa opened the scoring in the 18th minute, but Rakitić’s penalty in the 73rd minute equalised for the away team, who also had a man sent off in the final minute of the match. “We always imagined that this would be an encounter that would be resolved by fine details and that’s how it was. It was a hard fought game with a lot of competition, both teams seeking out the errors of their opponent. We’ve taken a point which serves to keep us in a privileged position in La Liga,” said the Atletico Madrid manager, whose team next face Athletic club in the Copa del Rey. With reports emerging claiming that the German midfielder of Real Madrid is unhappy with the Spanish club, it was becoming more and more plausible that Khedira was going to exit Real Madrid in the winter transfer window but after suffering from a knee injury during Germany’s match against Italy, Ancelotti stepped it up and said that he will not be looking for a replacement. We have two solutions: one is to bring in a player with similar attributes toKhedira, while the other is to change the system. ‘’What’s important is for the players to feel comfortable in the system. We have players that haven’t played that much but are in good shape, like Casemiro. I need to ponder the solution. We have no plans to change the squad’’. C.Ronaldo and Gareth Bale are leading the charge for Real Madrid both in Champions League and La Liga as they are finally appearing to be making the partnership that every fan of Real Madrid wanted them to. Even with the newly formed partnership from the Welshman and the Portuguese star, Real Madrid still is however trailing behind Atletico Madrid and Barcelona in La Liga and the real hit they suffered was when playing against their rivals Barcelona as they lost 2-1. They are hoping to get revenge and bring it back if they are to meet in the next stages of the Champions League as both clubs are at the edge of securing their place into the last 16 teams of the European tournament. 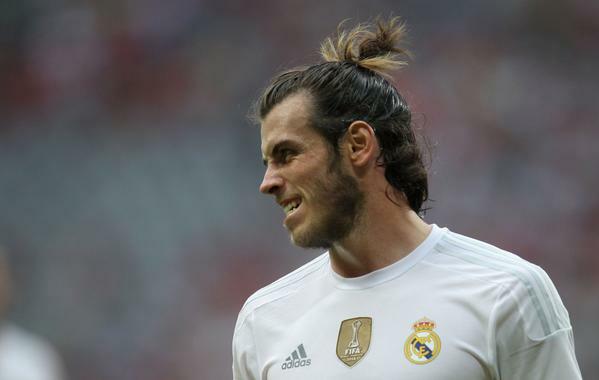 Taking into consideration the huge price tag of Gareth Bale (€100 million) it will be a disappointment if Real Madrid fails to win the Champions League or La Liga. Former Barcelona and Real Madrid midfielder Luis Figo has said that he expects Inter Milan’s Mateo Kovacic to be one of the best playmakers in the world. He is often compared alongside his compatriot Luka Modric and Figo thinks that the comparisons are correct. The manager of Atletico Madrid, Diego Simeone, has said that his team is still not the favourite to lift the La Liga trophy this season. Atletico has started its La Liga campaign fantastically well this season. They have won each and every La Liga game that they have played so far and are currently at no. 2 in the points table with 21 points in 7 games. They are behind Barcelona on the basis of goal difference. Recently, Atletico won its first La Liga Madrid derby in the last 14 years by securing a 1-0 win over the local rivals Real Madrid. Because of Atletico’s consistency so far in the season, the experts believe that they are the serious contenders for the La Liga title, but, Simeone doesn’t think so. Simeone has been the manager of Atletico since the last 20 months or so. He had joined the club in the middle of the 2011-12 Season. The former Argentinean player has had quite a bit of success during his tenure at Atletico so far. The team has won some big trophies under him in the last couple of seasons including the Europa League, the UEFA Super Cup and the Copa Del Rey. Under Simeone, Atletico has so far played 97 games out of which they have won 62.